This is a healthy alternative to ice cream that’s thick, creamy and sweet. This version of the recipe uses my personal favorite fruits – mangoes, bananas and raspberries – but you can switch out for your own personal favorites. It’s so quick and easy, vibrant and refreshing and best of all really tasty! This was my first video for Jamie Oliver’s new YouTube channel, Family Food Tube. They have so many great recipes for parents and families, so if you haven’t subscribed, make sure you do! Just click on this link. I had a great time making this video – thank you, Family Food Tube! This is a healthy alternative to ice cream that’s thick, creamy and sweet. This version of the recipe uses my personal favorite fruits - mangoes, bananas and raspberries - but you can switch out for your own personal favorites. It’s so quick and easy, vibrant and refreshing and best of all really tasty! 2. On a chopping board, slice the banana into bite-sized pieces. 3. Pick off and discard any stalks from the seasonal fruit. 4. Use a potato peeler to peel the fruit, if needed. 5. Cut the fruit into bite-sized pieces, removing the cores, if needed. 6. Place all the chopped fruit onto a tray, spreading them out so none of the pieces are touching each other. 7. Place the tray in the freezer for around 2 hours, or until frozen. 8. Once frozen, remove the tray from the freezer. Transfer the fruit to a sandwich bag, seal it up and return it to the freezer. 9. Place 6 small glasses into the freezer to get extra cold. 10. Meanwhile, place the honey and yogurt into a food processor and blitz until combined. 11. Remove the cold glasses from the freezer. 12. 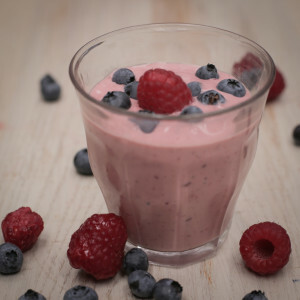 Working quickly, take the frozen fruit out of the freezer and add to the food processor. Blitz well until smooth and combined. 13. Spoon the frozen yogurt into your glasses, top with fresh raspberries, and serve straightaway or place into an airtight container and freeze for another day. Jamie's tip: Whenever you have overripe fruit, chop them up and freeze them in sealable sandwich bags ready to blitz into a quick frozen yogurt another day. Your Website Is Awesome! I’ve Seen You In Rachel And Guy’s Kids Cook Off And You Were Amazing. I Am The President And Webmaster Of Panda Rescue Team (York, Pennsylvania). I Am 9 Years Old. Keep Up The Great Work! See My Websites And Donate! And Email Me If You Done It! Hi Randelle! Thank you so much! that is so cool! I will definitely need to check that out! Thanks Amber! And You Look Kinda Like My Sister.